Visit Hotwire online at Hotwire.com Hotwire which is a leading discount travel site that offers low prices you won't see anywhere else. 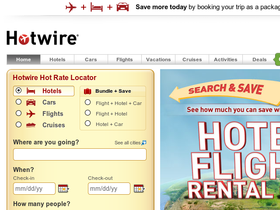 Whether you're looking for airline seats, hotel rooms, or rental cars Hotwire.com has the lowest prices. Hotwire.com's posted price model makes it easy for you to find a great deal without bidding or guessing. Save on your next purchase from Hotwire.com with discounts, coupons, promotions and savings from 58coupons.com. Be sure to book your next vacation with Hotwire.com and save up to $450 on air and hotel packages. Click link for details. With Hotwire you'll save up to 55% off 4 Star hotel rates. Click link to view. Save up to 20% when you book your cruise early with Hotwire. Click link for more information. Hurry on over to Hotwire to save on nationwide airfare starting at only $49. Click link for details. Book a cruise with Hotwire.com starting at only $199. Click link to book. Head on over to Hotwire.com and save on car rentals starting at only $13.95 per day. Click link to get started.